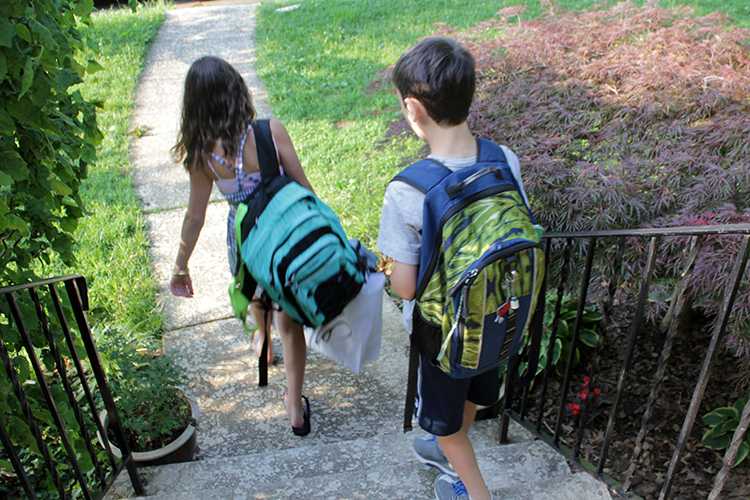 Back to School Safety, Part II: A Safe Walk to School - McIntyre Law P.C. It’s that time of year again — kids are excited for going back to their classrooms (we hope), fresh crayons, sharp pencils, squeaky shoes and that back-to-school haircut. For most, it’s an exciting time to meet a new teacher, make new friends and the promise of a brand-new year. But, amid all of the excitement, we all need to think about our kids’ safety, too. While some children take the school bus to school, others are driven by their parents and some walk. In case you missed it, check out our bus safety tips. Here, we’ll help you keep your pedestrian child safe on the way back and forth to school. Never block the crosswalk in an intersection. If you’re waiting to make a turn or stopped at a red light, no portion of your vehicle should be inside or covering the crosswalk. If the crosswalk is blocked, then pedestrians have no choice but to go around your vehicle, potentially further into the intersection, which could put them in danger. If you are traveling through a school zone and see a warning flasher blinking, you must stop for pedestrians crossing at a marked crosswalk or for a pedestrian crossing the intersection without a marked crosswalk. As well, if you’re directed by a school patrol sign, crossing guard or school patrol officer to stop, you must do so. Regardless of whether or not you have the right-of-way, don’t ever honk your horn, rev your engine or otherwise scare or harass a pedestrian — especially a child. Children should always walk to school in a group (or with at least one friend), but not alone. Children under 10 years old should walk with a responsible adult. Think about setting up a system similar to a carpool, where parents take turns walking a group of children to and from school. Always walk on the sidewalk where possible. Always walk facing traffic if not using the sidewalk. Always cross the street at a corner or intersection where possible. Always look left, right, left before crossing the street or stepping off the curb. Children should walk, not run, when in the streets or on the sidewalk. Teach children that they should never run or dart out from between parked cars or any other obstructions, because it will be hard for oncoming motorists to see them. Before school begins, do a “dry run” walk with your child. Be sure that he knows the route, and that the route is safe. There should be well-trained crossing guards at all major intersections. Tell your child to stick to the designated route. He shouldn’t let friends talk him into “shortcuts” or diversions along the way. Make sure that your child understands “stranger danger” and what to do if a stranger approaches or tries to convince him to get into a car. Have your child understand that he should never accept a ride from even a seemingly well-meaning adult. Talk to your child about not pushing, shoving or chasing friends along the way to school, even on the sidewalk. Also, talk to your child about any bullying that could happen on the way to school. Walking to school is great exercise for your child and for you! You might enjoy the time to catch up, hear about your child’s day and take a few breaths of fresh air. Enjoy!